To reduce your spa's operating costs, keep it covered with a tight-fitting insulated cover when not in use. When installing a spa, insulate it well around the sides and bottom. Heat the spa only when you plan to use it, allowing time for warm-up, and keep its temperature at 102°F or lower. Check the accuracy of your spa's thermostat. An inaccurate thermostat can cost you hundreds of dollars each year. Filtering is another major cost of owning a spa. Average spas have 2-hp filter pumps which cost about $.20 an hour to operate. These simple steps can help reduce filtering costs. Reduce the number of hours you filter. The average spa requires one-half to one hour of filtering each day. Filter enough to maintain water clarity. If you have a pool maintenance service, be sure to check with them before reducing filtration hours. Have your filter pump operation checked yearly by a qualified pool maintenance company. A malfunctioning filter pump costs more to operate. When it's not needed, switch off your aerator, the device that adds bubbles to the water jets. An average aerator is 1-hp and costs about $.10 an hour to use. The initial cost of a solar heating system is generally higher than for a conventional heater. A back-up heating system is required. 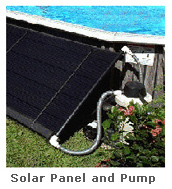 Solar heating systems work only during daylight hours and will not heat the spa at night.